Decoy isn't just an emcee. He's approached the drum 'n' bass game with an entrepreneur's mindset and, against the odds, it's paid off. You see, in a way, we're witnessing the second coming of Decoy. A few years ago he was steadily rising up the rankings, hitting those coveted main stages, emceeing for Logan D on Kool FM…things were running. But then he made a strategic decision which might have been a dangerous gamble for someone less business-minded. Instead of pushing on with his upwards trajectory, he stepped away from the scene and opened a gym in his native Southend-on-Sea. Cut forward a couple of years. Having built a business and, with it, financial security for him and his family, he approached his return to the scene with an equal level of tactical acumen. 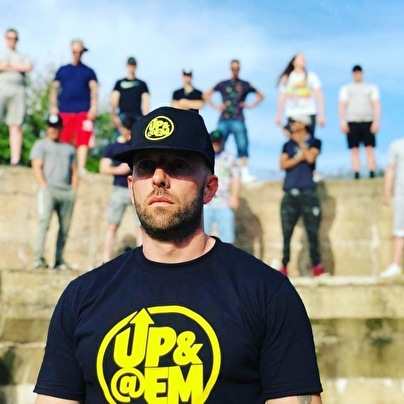 Recognising a gap in the market for emcee-led jump-up DnB, he resolved to sculpt his career by creating a series of videos showcasing brand new bars and music. And when tunes like "Flames in the Booth" and "Made it Thru the Storm" started clocking up thousands of views and creating an army of fans, promoters had to take notice. Decoy's reacquisition of his main stage status was assured. Now, Decoy's taking things to the next level. Having created his Up & @ Em brand, he's using his reputation to push the next generation. Winning a spot in one of his cypher videos has quickly become a mark of quality for an up-and-coming emcee. Events promotion, a clothing range, and a label for his original music are all now encompassed in this expanding empire. And, amidst all of it, it's important to remember that Decoy's one of the most thoughtful and technical lyricists around. With an immense respect for the craft of writing, his bars are peppered with complex flows, punchlines, and imagery. When you add to that his stage presence and crowd connection, no wonder he's a regular on some of the biggest stages DnB has to offer, not just in the UK, but around the world. Given his proven entrepreneurial skill, if you don't know about Decoy and his Up & @ Em brand now, you very soon will. A top echelon emcee, pioneer of vocal jump-up DnB, and boss of an ever-growing business portfolio, this is his moment. Watch for what's coming.